Paul Allain, Professor of Theatre and Performance in the School of Arts and Dean of the Graduate School, has just edited a volume in the book series The Great European Stage Directors (Methuen, 2018), available as part of a set of four books. The Great European Stage Directors comprises of two sets offering an authoritative account of the work, lineage and legacy of the major European theatre directors from the second half of the twentieth century. The first set covers pre-1950 directors, the second set explores directors working post-1950 to the present day. 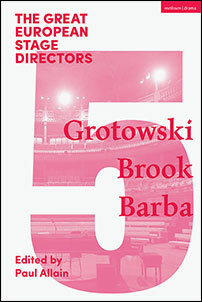 Paul has edited book 5 in the second set, including contributions on Polish theatre director Jerzy Grotowski (1933-1999), English producer-director Peter Brook (1925-) and the Denmark-based Italian theatre director Eugenio Barba (1936-). The book draws upon Paul's own research interests in Polish theatre and includes a substantial chapter on Grotowski.